After hearing so many great things about Pequod’s pizza, I was anxious to try it out. I apologize to family and friends who wanted to try this place with me! My uncle happens to live near the restaurant in Lincoln Park and wanted to take me out for pizza, so I couldn’t resist! At first glance, I saw this place and was a little puzzled by its appearance. That definitely didn’t hold us back from heading inside. It did not have the allure that Chicago Pizza & Oven Grinder or Pizano’s might have had, but my stomach was grumbling with excitement to order some grub and I didn’t care. I was HUNGRY. Our waitress, Anja, was awesome and gave us great suggestions for pizza. As you may know, my favorite thing to do at restaurants is ask what THEY recommend. It’s important because many places are ‘known’ for a certain ingredient or topping. Then again, I’m also a fan of getting a plainer pizza to sample their basic ingredients. Anja gave us so many suggestions of toppings to order, so it was clear that MANY of Pequod’s toppings were great. We ultimately ordered two combos she suggested: A medium pan pizza (6 slices=3people), one half= pepperoni, garlic, and spinach, other half=sausage, green pepper, and onion. This was quite an experience for me because I am sometimes a creature of habit, content with a cheese or pepperoni pizza, but I was ready for the great combinations of toppings and excited to try both. I was ready to chow down, but I took about 3 seconds (that’s all I could handle) to snap a picture of their famous carmelized crust. It was burnt, but that’s how they make it. This isn’t your ‘fluffy’ pan pizza that just tastes bready; this is your crunchy thick pizza that tastes good in each bite. I started with the pepperoni slice, and was a bit overwhelmed with the bunches of pepperoni and blast of garlic at first. They definitely don’t skimp on their toppings. Sauce is standard, cheese is good, but these toppings were pretty baller. The pepperoni was great, and then I moved onto the sausage slice. Fresh sausage pieces topped the pizza, and the crunch of onions and peppers made it a flavorful slice. I think I would choose the pepperoni, garlic, spinach combination because it looks tamer, but definitely packs in the punch. I was thankful for the waitress’s suggestions because it’s often hard to think of good combinations for pizza toppings. 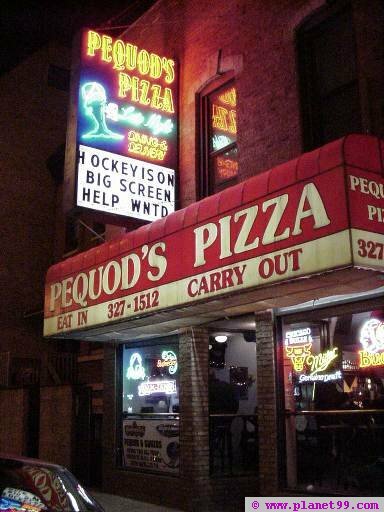 Pequod’s was a great pizza- not traditional chicago style, but CHICAGO pizza nonetheless: Crunchy fresh goodness, and don’t forget to try some of their toppings when you stop by!